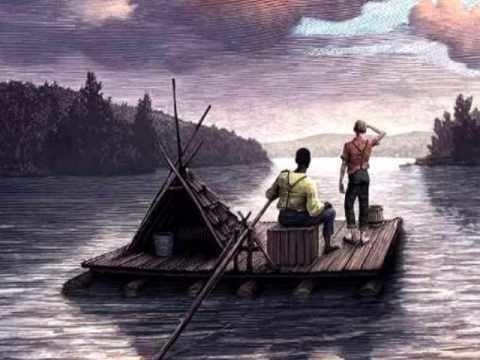 In Mark Twain’s The Adventures of Huckleberry Finn thirteen year old Huck runs away and goes on an adventure with Jim, a slave looking for freedom. Huck faces many different situations in which he is forced to react quickly or makes hard decisions in a short amount of time. He often doesn’t think things through and does the first thing that comes to his mind, like the multiple times he tried to pretend to be someone else. The first large event where we can see why Huck acts like he does is when Pap is introduced into the story it makes sense that Huck isn’t used to conforming to society. As we see more about Pap and his alcoholism and abusive tendencies, we can start to see how Huck was raised. Huck wasn’t raised in a family, like most kids, and because Pap used him to get money, he was never really loved or taught right from wrong. When Huck is living with widow and she tries to help him transition from living on the streets to living in a wealthy home, he really struggles with the transition, he doesn’t understand why he’s supposed to pray, or why he he has to learn things like spelling and etiquette. Huck isn’t used to the luxurious lifestyle that is provided to him and he struggles to conform. He doesn’t like being “civilized” and because of this we can see why he runs away and goes on his adventure. Huck is also easily swayed by what other tell him to do. Tom Sawyer, who he looks up to immensely, tells him that he should stay with the widow so he stays. When Huck is staying with the widow he could have just ignored when she told him to do things, but instead he did as told even if he complained about it. He also follows what the Duke and the Dauphin when he travels with them. Huck is a people follower and does as he’s told, especially when he looks up to the person. When he doesn’t want to do what’s been instructed he often will complain about it and put it off for a while, but he would still do it at a later time. This could be a prime reason at why Huck is bad at making decisions, because normally people will make them for him. Huck’s past with Pap and his being swayed easily are two very large part of who Huck is. Most situations that Huck gets put into are because one of these two things. Huck tries his best to do what he wants or thinks is right but it often doesn’t work. Why Huck acts like Huck by Hadley is licensed under a Creative Commons Attribution-ShareAlike 4.0 International License. Hadley I agree with you that Huck is an easily swayed character and I agree with you that his tendency to listen to what he is told to do has prolonged the suffering of him and his acquaintances. I think if Huck listened to his gut more often like he did near the end of the book Jim and him would have escaped to the free states and he wouldn’t have gone through the mess he did to find out his trip was useless. Huck Finn grows throughout the book. Where do we first see him make a moral decision for himself? Personally, I think he makes his first moral decision when he lies to the men catching runaway slaves on the Mississippi River. I think when he hid Jim’s true identity from the men he made his own choice. Do you think that Huck only listens to people he sees as more powerful than him? Do you think Huck only opposes the social constructs formed by wealth and civility? I agree with your opinion. In the beginning of the book, we can see the struggling relationship between Huck and pap, and how it affects Huck and what he does. Huck is in strain with being with pap, but he also decides on his own to fake his death to escape from pap’s captivity. Do you think this was the first step in Huck’s developing maturity? We can also see his developing maturity throughout the book, but we also see the contrast of Huck being a follower. In the beginning of the book, we see Huck following Tom Sawyer’s lead, later the king and the duke, and finally near the end with Tom Sawyer. Throughout the book, Huck never learns to be a leader instead of following one, and maybe Twain made it this way to show Huck’s continuing steps in life to improve his own thinking and leadership skills.